We first heard about the Thunder a month back, but today we get a face to go with the name. BGR has again gotten their hands on an exclusive picture of the device, and it's not too far off from their original mock-up. Physically the device is laid out pretty similar to current BlackBerries, minus the keyboard of course! It looks like there will be a left and right multi-function key, there will be the familiar four key cluster at the bottom- sans trackball this time- and the only difference is that there will be music controls at the top right corner, opposite the traditional device lock button placement. No new specs were given for the hybrid CDMA/GSM device, but it just got way more real. Verizon users, get excited! This is what its all about, first Alltel is bought out and now this, but wonder how it will hold up against the dare? Guess we will have to wait on the specs..
the dare is a phone, this blackberry is smartphone. just because two phones are touchscreen, it doesn't make them competition..
the blackberry is a hybrid so you could compare many of its features to to Dare. actually Nokia makes several phones (N series) that are much better in terms of camera, internet speed, battery life, functionality, memory, etc. than both iphone and blackberry. The problem is I can't find a service provider who will carry such high end Nokia phones in USA to offset the cost of the phone itself. This will give Steve Jobs sleepless nights!!!!!!!!!!!!!!!!!!!!!!!!!!!!!!!!!!!!!!!! 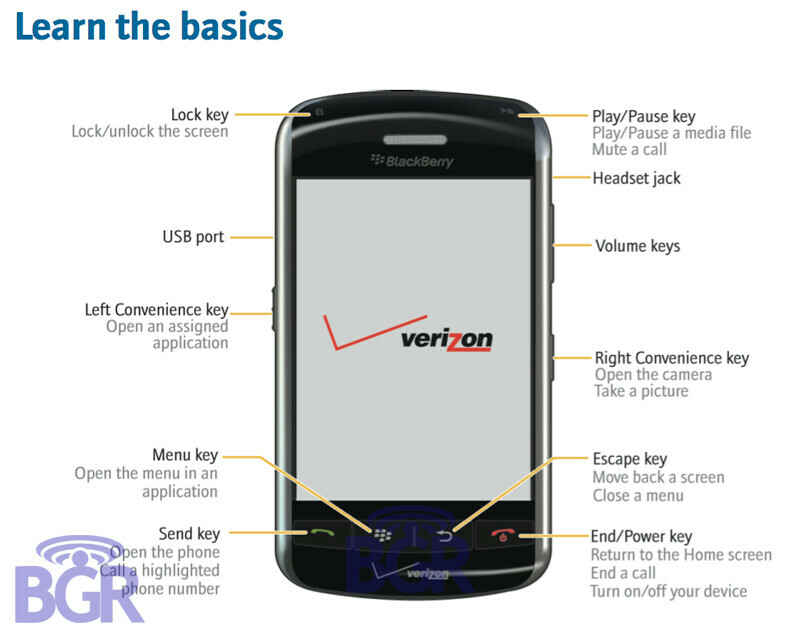 Anyway, i'm still waiting to hear if RIM will be using thier 'multi-touch' UI that they were working on. I'm guessing that its ready, which is why they made this touchscreen Blackberry. AWESOME. Guess this will have to do until Verizon gets the iPhone (about 4 more years? )...hopefully Verizon won't drop the ball this time. Verizon Wireless will never offer the iPhone. Verizon was offered it first and turned it down. The primary reasons were that the phone could not support high speed data transfer, which was foolish. And Apple's strict marketing requires all maintence to be completed in an Apple store instead of what would have been VZW stores. And too, Apple wanted too much of profit from each phone. Those are reasons why VZW's financial stability is much much higher than everyone else. Think about it right after i phone launched verizon came out with the specs for any manufacturer to make handsets for them as long as it meets certain specs and tests. so when the exclusivity is over with att i can guess what apple will do. Why would Verizon want the POS iPhone? It's the first super popular "all touch" phone, yes. But the iPhone will not reign as the superior all touch screen phone. It's not even superior now. Sorry but the open device offer doesn't include GSM handsets. Unless a CDMA variant launches, don't expect to see an i-phone on big red's network any time soon. What is the most "superior all touch screen phone" right now if it isn't the iPhone? As a business device? Perhaps the HTC Touch Diamond. Why are you talking about the upgrades to the iPhone? Who cares? Next time you comment, write something informative and part of the discussion, dumb@$$. dayum!!!! AT&T wha? Tmobile wha? Sprint wha? Verizon is just AMAZING now! I think I'd rather the Dare than this, though, because of my needs. Dude, the VX 9700 and the Dare are the same phone. Pay attention. I wonder if this will be a global phone too or not. This is a Global Phone. CDMA/GSM both Verizon and Vodaphone is getting this phone and it's the same phone, same specs. Finally an iPhone killerfor us verizonites! There is no iphone killer there will never be a iphone killer. The iphone is the best!! !